Today we "installed the bees". This is just the term that is used when you are putting bees into a hive. 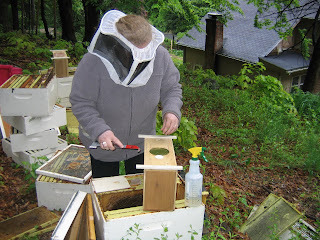 The first hive went well, bees dropped down into the hive and the queen was released with very little effort. 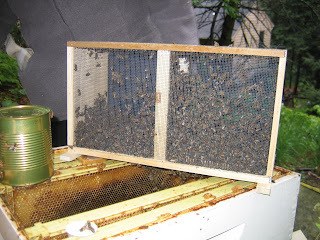 The second hive however gave me some trouble and the bees got a little annoyed and there were some bee stings! My coat took the brunt of it. In the first picture I am trying to get the can out of the center. It is filled with sugar water and is a bit heavy to get out. In the second picture a gentle tap of the package sends the bees down into the waiting frames in the hive. It was nice today to see the bees buzzing about. Everything is either in bloom or about to bloom so we got the bees right in time.